A Guide to Vaporwave Sub-genres was originally published in 2014 on the /mu/ section of the 4chan image board – one of the earliest and most influential communities with regards to the history and development of vaporwave. This guide is currently a featured posted on the sidebar of the /r/vaporwave subreddit and is often a resource to which newcomers are directed when posts are made asking for recommendations. This guide has not been updated since 2014, however its topical approach to various vaporwave tags in addition to offering five example albums of each genre makes it a thorough yet easy-to-navigate glossary. Newcomers can use this guide to develop an understanding of commonly-used tags in vaporwave (e.g. “vaportrap”, “ECCOJAMS”, “hypnagogic drift”), and the selection of albums has stood the test of time in that many of these releases are still considered foundational elements of vaporwave by community members and producers. A Guide to Vaporwave Sub-genres has a few definitions that are not applicable to the contemporary vaporwave scene. “Faux-utopian”, “vapormeme”, and “utopian virtual” are rarely – if ever – used to describe vaporwave subgenres, and the albums that are listed under them could easily be placed in another of the describing terms. For example, REDEFINING THE WORKPLACE by INTERNET CLUB could also fit under the “hypnagogic drift” tag. The list also lacks other terms such as “signalwave”, “classic-style”, “dreampunk”, and “hardvapour”. This is understandable as those terms (excluding “classic-style”) did not even exist by the time this guide was published, as “dreampunk” became more in use in the beginning of 2015 due to the focus of the Dream Catalogue label on futurist cyberpunk music with lots of ambient influences, and “hardvapour” started in late 2015 upon the release of Vaporwave Is Dead by Sandtimer. As a survey of vaporwave from 2010 through 2014, A Guide to Vaporwave Sub-genres is a good place for brand new initiates into vaporwave to learn more about early influential releases that have mostly stood the test of time within the community. Its simple graphical display is easy to navigate and does not take much time to identify album artworks. Finally, its use of five albums per tag is quite manageable. The Beginner’s Guide to Vaporwave has some significant flaws in terminology and history, some of which is owing to its publication date but mostly due to faulty information. For example, under the “Vaporwave” header, the writer refers to Vektroid having created vaporwave in 2012 upon the release of FLORAL SHOPPE through the MACINTOSH PLUS moniker. This is simply not true, as the history of vaporwave (although perhaps not that term in particular) stretches back to at least the release of Chuck Person’s ECCOJAMS Vol. 1 by Daniel Lopatin in August 2010. Even excluding that album, there are still works by 骨架的, INTERNET CLUB, Datavision Ltd., and Midnight Television to consider – not to mention other Vektroid projects such as fuji grid tv. Another flaw is the mention of “hypnagogic” as being primarily made of “multiple TV samples, and it’s (sic) 80s TV inspired aesthetic”. Although this is true – many hypnagogic drift artists sample from television advertisements and media – it is also true of practically every other vaporwave subgenre, including broken transmission, signalwave, and classic-style vaporwave. The guide also refers to “post-vaporwave” and “dreamwave”. The former is rarely used except as tongue-in-cheek. Given the definition used in the guide, the latter almost certainly is referring to “slushwave”, which is the tag used by telepath, or “dreampunk”, as Dream Catalogue would have begun to make itself a household vaporwave name at about this time. The Beginner’s Guide to Vaporwave also includes splash pages on artists, albums, and labels. 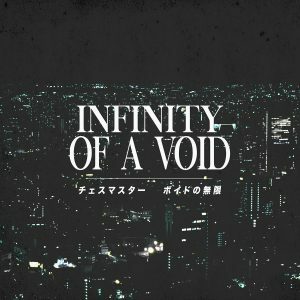 Unfortunately, many bandcamp links on the “albums” page are now dead, mostly due to the Beginner’s Guide heavily leaning toward Dream Catalogue releases that have since been scrubbed from their bandcamp page due to copyright issues and albums no longer reflecting HKE’s vision for the label. The descriptions per album are little more than one or two subjective lines that do not go into detail. However, the album and label lists do refer to works that have shown to be influential or community-recognized, in addition to featuring a few obscure releases/labels absent from other guides. The artist list only has six artists who are more comprehensively covered in other guides. Use the album and label lists. Of all the vaporwave guides from this time period, this guide has the most comprehensive list of vaporwave labels, despite the descriptions lacking in details. Also known as the Ultra Edition, this image-based guide lists 164 albums released from 2010 through mid-2014. (It was first published in early August 2014.) This is by far the largest amount of albums within any major vaporwave guide, and it is one of the first guides pulled up when searching for “vaporwave guides”. The album’s grid format makes it easy to identify releases with their album and artist without clutter. Community members often refer to the Ultra Edition as the place to start for a survey of vaporwave from 2014 and earlier. In terms of a comprehensive curation, this is no argument. However, the Ultra Edition can be pretty overwhelming for new listeners given its enormous catalogue that incorporates hundreds of hours of featured albums. Additionally, takes a very topical approach to vaporwave sub-genres, with the primary differentials being “classic-style” and “hypnagogic” with only thirty-nine albums listed under the other tags “future funk”, “vaportrap/vapor-hop”, “compilations”, “Vektroid”, and “proto-vapor”. 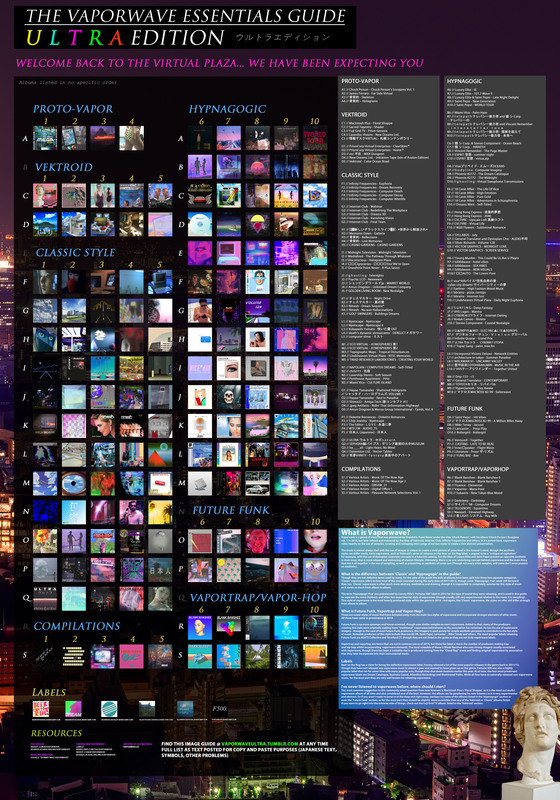 The Ultra Edition provides some brief definitions and an overview of vaporwave in the bottom right-hand corner. In particular, its explanation of the difference between “classic” and “hypnagogic” are particularly relevant and a good overview as to their differences in composition and affect. The Ultra Edition does not provide any additional details or blurbs associated with albums, making each album basically a random choice of listen for uninitiated listeners. The “labels” list is outdated given the guide’s publication in 2014, but the six that are mentioned remain solid introductory labels for vaporwave listeners. All albums mentioned within the Ultra Edition may be downloaded at this tumblr link. The tumblr link also lists each album in text format, which will help anglophones in searching for artists and albums since the Ultra Edition is an image, and images do not allow for copy-and-paste into text strings. As a source for music (and with album links included), the Ultra Edition is an unparalleled overview of 2010-2014 vaporwave releases. Listeners should consult this guide after they have gained some familiarity with tags and sub-genres through guides such as A Guide to Vaporwave Sub-Genres so as to not be overwhelmed with the sheer amount of albums – unless you’re looking to start a vaporwave resource network. Intended as a follow-up to the Ultra Edition, the Nu Edition was published at the end of 2016 following a nomination period and a round of voting on the vaporwave subreddit, various message boards, and on the /mu/ subforum of 4chan – as overseen by /r/vaporwave moderator Nuvpr. The lists are almost identically designed: there is a column for releases with genre tags, a list of labels, and a list of each respective album and artist arranged in a grid format. The Nu Edition comprises 100 albums released from 2014 to 2016 under six tags. The Nu Edition assumes familiarity with at least some of the albums from the Ultra Edition. The headers “classic”, “hypnagogic”, “vaportrap/hop” and “future funk” all retain their original definitions from the Ultra Edition. Two new tags – “hardvapour” and “parodies” – are not defined. “Parodies” is obvious. “Hardvapour” refers to a musically-aggressive offshoot of vaporwave that began at the end of 2015 by artists such as HKE and wosX in response to their perception of the vaporwave scene being saturated with flippancy and self-indulgent irony that constrained artists more than it encouraged innovation. The genre’s roots were influenced by Eastern European and Russian culture in contrast with the East Asian and Japanese culture often associated with vaporwave, and musical influences include gabber, industrial techno, IDM, and noise music. All albums may be downloaded at the “mirrors” page of the Nu Edition‘s Neocities web page. All albums are also listed in text format for easier web searching. More information on the Nu Edition may be read in the corresponding reddit thread. 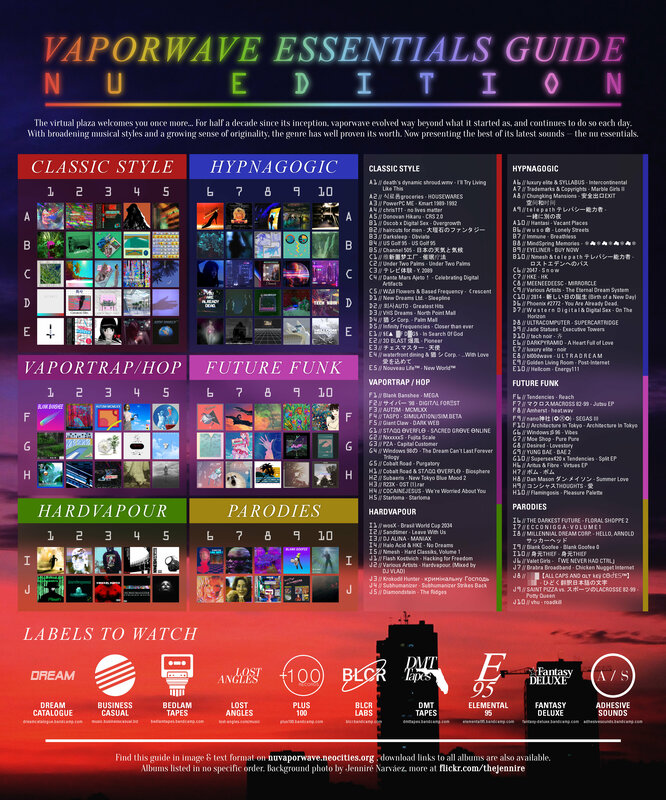 Along with the Ultra Edition, the Nu Edition is the best source for a comprehensive album listing that was directly voted on by a vaporwave community as being most representative of vaporwave and its subgenres from 2014 through 2016. Its smaller album pool and more compact design make it more manageable as a single full download than the Ultra Edition. This guide is highly recommended for listeners who wish to catch up on modern vaporwave, especially since the Nu Guide captures the paradigm shift of dreampunk and hardvapour that took place from 2015 and 2016, making the Nu Guide an interesting historical snapshot on not only vaporwave’s development but also the community’s interpretation of that development. Vaporwave Subgenres is a guide that features individual descriptions of vaporwave genres and corresponding albums along with release information by RateYourMusic user Harley_Magoo. It was originally published in 2014 but has since undergone several revisions and updates to reflect contemporaneous trends and community feedback. It features several discussion points on vaporwave production techniques, influences, and under what context certain terms are used – for example, acknowledging that “muzakcore” is informal but reflective of the influence of muzak in various strains of vaporwave. Each album blurb includes a basic description of the album in addition to recommendations for whom and under what circumstances an album should be listened to get the experience most likely intended by the artist. For example, Harley_Magoo states that The Pathway Through Whatever by Mediafired is an “essential follow-up listen” to Chuck Person’s ECCOJAMS Vol. 1 for the burgeoning vaporwave fan. The blurbs also occasionally include a brief mention of the album’s historical relevance to its associated subgenre and the vaporwave community at-large. For example, the blurb for TV Party by luxury elite discusses how the album represents “the shift” in vaporwave sound circa-2013 with respect to sample curation and “pseudo-sleaze” associated with albums that utilize adult contemporary music with a lo-fi sheen. VitoJames is a long-time member of the vaporwave community who rose to prominence early on in the genre’s life with the DMT Tapes FL label (and its later imprints DMT[REC] and Verbatim Consciousness Recordings). VitoJames has also released a myriad of full-length albums and EPs under almost as many monikers, which exemplifies vaporwave pseudonymity more so than any other artist other than Vektroid and HKE. In addition to his production work, VitoJames is also a prolific reviewer and list-maker on the community music web site RateYourMusic, of which he as been a member since March 2006. He currently runs a variety of vaporwave review lists such as “110+ Vaporwave Record Labels to Get You Started into the Genre” and “1001 Vaporwave Albums You Must Hear Before You Die”. His write-ups use a highly emotional and discursive tone that frequently incorporate personal anecdotes concerning the atmosphere of the music and the relationship between vaporwave and his every day life. While not exactly a guide, the RateYourMusic page of VitoJames is easily the most comprehensive resource in the history of vaporwave. VitoJames produces and listens to an extremely large amount of resources, and his passion for the genre is evident. Utilizing VitoJames’ page as a source for finding random vaporwave albums once the aforementioned lists have been exhausted is an excellent way for new and not-so-new vaporwave listeners to continue to explore the genre. VitoJames updates his lists with new information as it is available; he includes the date of last update in most of his write-ups. It is important for listeners to remember that VitoJames is one person, so his ratings and reviews are going to be highly specific based on his listening experiences and history as a producer/community member. This contrasts with the community lists of the Ultra Guide and the Nu Guide. This must be kept in mind when reading individual reviews instead of guides that seek to be comprehensive simply because individual RateYourMusic reviews need not attempt objectivity or full representation but are instead reliant on personal listening habits. He primarily favors classic-style vaporwave, sample curation, vaporhop, and hypnagogic drift. He leans negatively toward hardvapour, dreampunk, and vapornoise – often excluding them from his lists altogether. 1Sunbleach is no exception to this rule. We encourage listeners to make up their own minds when it comes to artists, albums, and labels by listening to works or by reading other information resource networks to get a broader view on vaporwave’s place in the contemporary music climate. That’s partially why we do album “recommendations” than “reviews”, because a “review” makes it sound like our word is God. 2There’s a theme here, as you’ll see.